John has many years experience treating and lecturing on the subject of sports injuries and sports therapy. 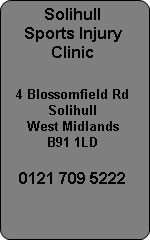 John is the founder of the Atlas Pain Relief Centre's and Solihull Sports Injury Clinic. Treating the likes of Peter Shilton, Ian Taylor, David Busst, Des Walker, Frankie Gavin, Tommy Langford Paddy Doyle, Nathan Woodward and Meghan Beesley and many Golf Pro's John is well respected in the field of Sports Injuries. Mr Amir Salama Consultant at Solihull Parkway Hospital, Solihull Hospital, Good Hope and Little Aston Hospitals. Mr Salama is a highly regarded consultant and surgeon who specialises in sports injuries of the shoulder knee, elbow and wrist. Peter Taylor - Sports Physiotherapist, Sports Podiatrist and Sports Therapist.